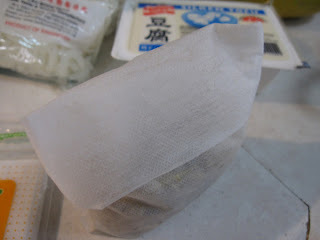 If you are like me, always cook soup base with tiny and loose ingredients, for instance, soy bean, dried anchovies or Chinese herbs, you need this soup bag, disposable one! 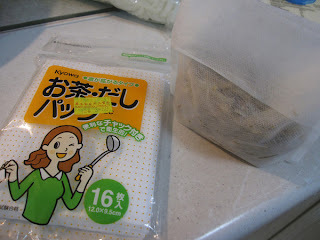 I bought the cloth soup bag once before, and wanted to use it in my soup cooking. However, I did not use it at all. That was because I really could not put myself to imagine putting a “cloth” to boil for hours.. It sound gross to me, frankly. Also, I had absolutely no idea how to clean the cloth bag and get rid of the ‘stain & smell’ emerged in the cloth after hours of boiling with soup ingredients. To use clorine? No way! Soak in soapy hot water? Goodness, the soup bag is for boiling soup, am I going to boil the soap in my soup, too, next time round??! For god sake!! No way, for me.. So, forget the soup bag, I boiled my soup without any soup bag, but adding all ingredients in the pot. I did that for all my soup cooking, until I found this disposable soup bag! Perhaps, you already are using this since ages back! Yes, I have ‘opened my eye’, just recently (laughing)! Where did I get this? I found this soup bag in a provision shop at neighbourhood area. This disposable soup bag comes in 3 sizes. The one I bought is smallest type as I thought it should be enough to fill in the amount of tiny soup ingredients I usually use. 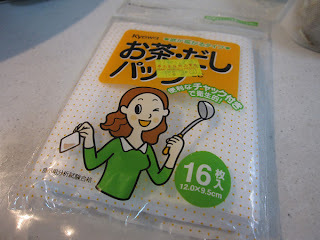 This 12cmx9.5cm soup bag costs about S$3.80, for a pack of 16 pcs. It’s easy to use. Just put in your desire amount of ingredient into 1 disposable soup bag. 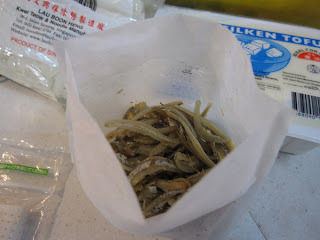 Only half of the bag was filled, with about 50gram of dried anchovies which I have put in for my papaya soup cooking. See, there is a half-folded layer at the front of the bag. 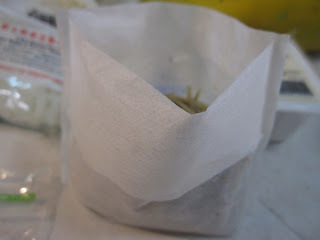 What you need to do is just turn the folded layer over to to another side of the bag, to cover the opening of for sealing purpose, before putting into your soup pot. Nice looking soup bag for your soup cooking, isn’t it? You don’t have to worry about the washing of soup bag anymore, after use! It’s so cool! Hmmm…. I doubt so, as this cost double of the $2 price of Daiso.. But who know’s.. maybe they have their own version which comes with more worthy price.. Or, try supermarkets! I saw it selling at cold storage in 2 sizes. the 8″ by 10″ is selling for only $1.90 for about 8-10pcs. May I know which section of cold storage did you saw it? The cold storage staff was unable to advised me. Hmm… actually, I did not get it from Cold Storage. I guess you were refering to the previous comment left by my reader. It was the reader who saw it from Cold storage, while I got mine from neighbourhood provision shop. So, I am not sure if Cold storage is selling this. Apologies. Maybe I could help you to search around later. Meantime, try to find it from other supermarkets such as NTUC fairprice, from kitchen utensils section. Hi Patricia, I’m wondering about this too, I just bought it, but all the information is in Japanese, I can’t read it, do you know if they guarantee that this product is bleach-free? I would really like to find out. Thank you. Hi good question. I am not so sure though!! I thought it looks like any other common material which does not need for a bleach on it.. Not too sure, really. Let’s try find out later..
Hi do you feel that the soup taste less flavourful using the soup bag? Or same. Same to me. :) Less scumbs and cleaner soup, in fact.